So, you know, November is NaBloPoMo. Which sounds like something that might be vaguely dirty, but in fact isn’t. Sorry. It’s just a month of posting more to your blog. And I was going to do this, post every day, get back in the blog routine. But oh, hello November 5 — you kind of snuck up on me! Just like those 4,000 pieces of Halloween candy. Were you guys working together or something? With Zombies? 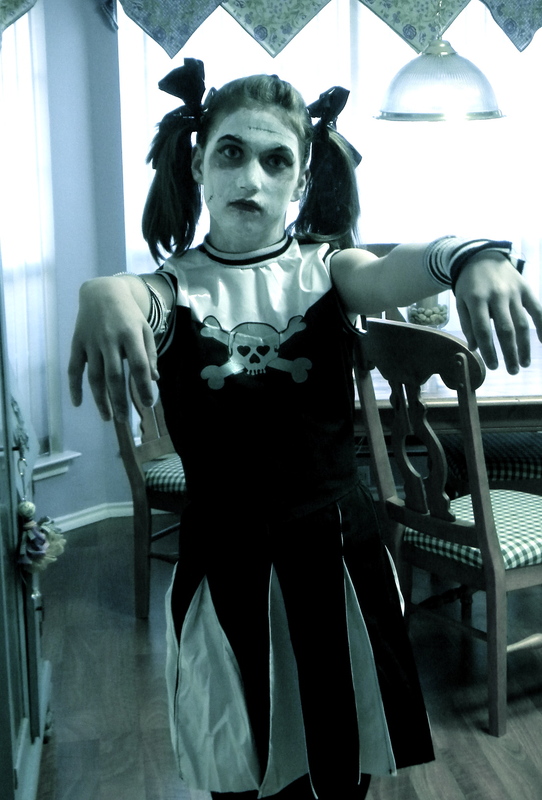 Zombie Cheerleader is not pleased to discover her candy missing. So, anyway, I’m going to do this now. NaBloPoMo a little behind schedule. NaBloPoMoSlo, let’s call it. My Son is Gay… or not. Read it. And then, decide something important. Decide you’re not going to jump to judgement. Decide you are going to be kind and loving to people who are different. No matter what your theology or what you think about “lifestyle choice vs. born that way,” decide you are going to show love. Decide you are NOT going to be the one who makes someone feel worthless. Decide you are going to be the one who treats everyone you come into contact with like a precious child of God. Because they are.